Growing up does not always have to be difficult, especially when someone like Bernhard Bamert is already 44 years "young" or Thomas Lüthi, an experienced 41, or only 32 as is Lukas Mantel. "In the past, we were more involved in apparatus engineering, i.e., we presented very complex pieces. In addition, everything was focused on humor. During our concerts, we wanted above all to play comic-like parts with a strong emphasis on groove. We sometimes just bombarded the audience's ears with our songs. Now we value sound and improvise more," trombonist Bamert described the changed orientation of Tré. This is thanks to the new drummer Mantel, but also to the acquired maturity of the founding members Bamert and Lüthi. Two men in their prime, of whom tenor saxophonist Lüthi also has to fulfill paternal duties and who want to be perceived as virtuoso music clowns instead of simply gaudy and rowdy lads with their fifth album in the meantime. "At some time, you simply get to the point when you are sick and tired of continually being ironic,” Bamert stated resolutely. "Actually, it is a question of the music. I take the fun of the whole thing very seriously in the meantime!" 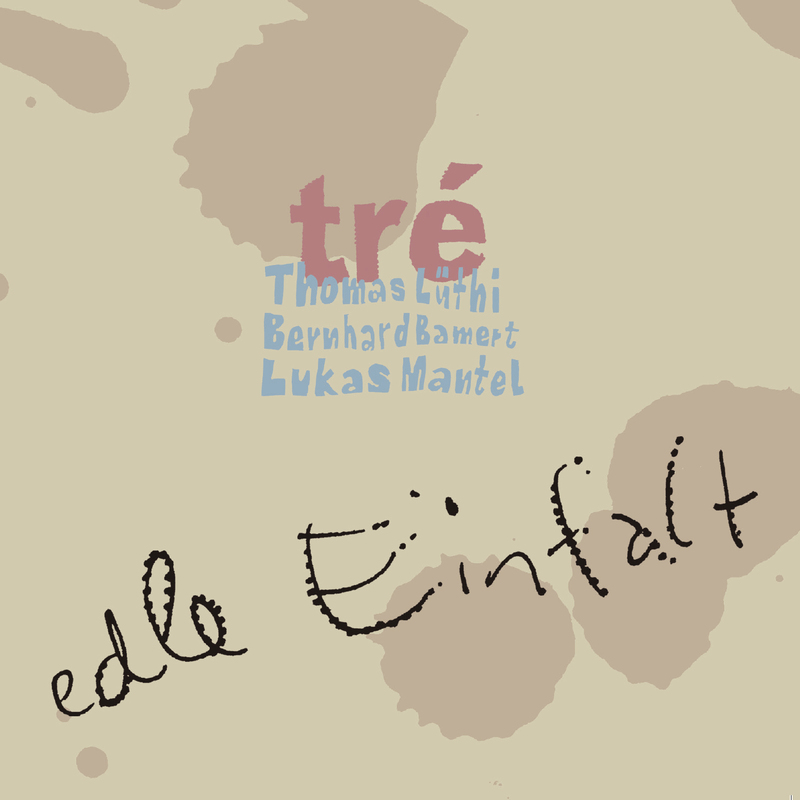 A song such as "Edle Einfalt" would be very appropriate to stir up associations with Dadaist predecessor works such as "Karpfen in Wilhelmsdorf" or "Aufwind". However, it concerns a lot more than a clever pun for the three-man band, who caused a furor with their debut CD "Fundamental Music" in 2006 as part of the successful "Jazz thing Next Generation" series and recently provided superb entertainment with an animated "Movie-Gipfel-Gig" (trans: Movie Peak Gig) at "Brissago" in 2012. "We want to get back to simplicity," Bernhard Bamert described their playing. To that end, Tré borrowed from the German writer on art Johann Joachim Winkelmann (1717-1768), whose formula "Edle Einfalt und stille Größe" (trans: noble simplicity and quiet proportions) in turn inspired Johann Wolfgang von Goethe. It is a question of the simplicity of the material dealt with: an approach in opposition to the playful and overloaded art of Baroque and Rococo. When Goethe visited Jakob Gujer, who became famous under the name Kleinjogg in the 18th century and who is considered a pioneer of modern agriculture, at his farm in Kratzenrüti near Zurich, he is said to have praised the simplicity of his concept with the term "noble simplicity". This is precisely the direction in which Tré wants to go: neither overloaded arrangements nor banal or even populist brown-nosing attempts. "Simplicity as a term was considered as extremely positive," Bamert explained. Concentration on the essential and providing simplicity more space again. The trombonist and his buddies sought solid ground in the jungle of contemporary jazz and found it in recalling simple song structures. As starting point, they selected song structures similar to nursery rhymes ("Drumherum", "Dente Caduto", "Ninna nanna" and "Kneipe"), folk-like melodies such as the title song "Nur" and "Tänzchen", prism-like conglomerates from Italian, Spanish, Jewish and Turkish set pieces such as "Canto" by Orchestre Goldberg, which caused a furor in Constantinopel at the beginning of the 20th century, "Árpád Jean-Gaspard Dschingis", "Comme Les Chiens" or "Anatol" as well as free improvisations ("Elf" and "Kommod"). Even classical jazz appears lean and ascetic in the new Tré outfit ("Milbe"). This is how it sounds when puberty is over for once and for all, and Bernhard Bamert, Lukas Mantel and Thomas Lüthi do not want to rest on the laurels of their "Sturm-und-Drangzeit" (storm and stress years) either. A listening experience to be taken seriously, but which is very entertaining and even turns into pure enjoyment now and then. Just a genuine Tré disk. "Jazzthetik Best Of 2015, Stefan Pieper, Category "Gift recommendation"." ""...the melodies are in the center of attention - and that not at all in a simple way. Instead of mixture, it is about pluralism, friction and discourse. For this, the release offers many genious-simple solutions."" "The chamber-music adventure presents swift, funny and cautious songs, with references to folk and jazz, Banda and New Orleans, a little bit of funk and still the jarring moments shine in clarity."